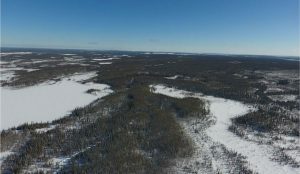 SASKATCHEWAN – Saskatoon-based UEX Corporation has the first drill results from its West Bear cobalt-nickel property located in the heart of the Athabasca Basin. Recent results have also allowed the company to extend the strike length of the deposit to 400 metres. Highlights from the first assays include 2.94% cobalt and 2.08% nickel over a 4.5 metre core length and 1.94% cobalt and 3.68% nickel over 11.0 metres. Both these results came from hole WBC-044 that had a total length of 13.8 metres averaging 0.72% cobalt and 1.06% nickel. Other assays were positive as well. Hole WBC-043 interested 012% cobalt and 0.31% nickel over 13.8 metres. WBC-042 returned 20.5 metres averaging 0.55% cobalt and 0.25% nickel, including 1.90% cobalt and 0.57% nickel over 5.5 metres. WBC-045 returned 20.5 metres at 0.04% cobalt and 0.14 nickel. The final hole – WBC-046 – returned 52.0 metres averaging 0.53% cobalt and 0.36% nickel, including 2.0 metres at 1.65% cobalt and 0.75% nickel, 9.0 metres at 2.17% cobalt and 1.07% nickel, and 1.0 metre at 0.96% cobalt and 0.94% nickel. True widths are estimated to be 90% to 95% of core lengths. UEX announced the maiden resource estimate for West Bear last July. Inferred resources were 390,000 tonnes grading 0.37% cobalt and 0.22% nickel for 3.2 million lb. of contained cobalt and 1.9 million lb. of contained nickel. The geology of the West Bear deposit is discussed at www.UEX-corporation.com.